He will also allocate £10 million to help children from disadvantaged backgrounds better access the natural environment, with grants awarded to projects that will create greener school grounds and increase the number of school visits to local parks, wildlife sites, care farms and National Parks. "I am delighted to launch the Year of Green Action. Over the next 12 months we will work with businesses and communities to create ways for people from all backgrounds to connect with nature, protect our environment, and contribute to restoring our natural world. 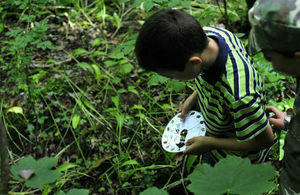 "As the future stewards of our planet, children and young people have a vital role to play in this. The £10million boost outlined today will help ensure there are no barriers for young people to access the benefits of the natural world and importantly enable them to play their part in environmental protection." During his speech, the Environment Secretary will call on everyone to play their part and back the Year of Green Action – from businesses to gardeners and government itself. It will provide a focal point for organisations, individuals, communities and businesses to learn more about their environmental impact and take action to reduce it. It comes as figures show one in 10 children do not regularly spend time outdoors. The £10 million programme allocated today will help schools and education providers with the highest proportions of disadvantaged pupils to design more outdoor-focused activities, boosting pupils’ contact with nature and supporting their health and wellbeing. The funding will also increase access to care farms, making it possible for 1.3million children and adults facing disadvantage or social exclusion to benefit from activities on a working farm. A key pillar of the 25 Year Environment Plan is to connect young people with nature and the projects announced today will be delivered by Natural England with a number of partners from spring 2019, with funding from the Department of Education. As part of this programme, the National Centre for Social Research will also be carrying out research to understand how activities in nature impact pupils’ mental health and engagement with school. "Connecting children with nature is one of the most important things we can do for them. It can boost their health, wellbeing and learning and give them a life-long love of the natural world that leads them to cherish and protect it forever. "I hope these projects will ensure that every child has the means of discovering the wonders of our wildlife." The #iwill4nature initiative, charity Step Up To Serve’s contribution to the Year of Green Action, will also launch today. The government-backed initiative is a nationwide campaign to grow environmental youth social action and support a series of activities for young people to connect with, protect and enhance nature. This includes appointing young ambassadors to drive environmental action in their communities and encourage environmental volunteering such as litter picking, planting pollinator-friendly flowers or fundraising to maintain or enhance green spaces. "Young people, like me, are pivotal in initiating the cycle of change to improve the environment for the future. The Year of Green Action and #iwill4nature together will connect, engage and challenge people, in particular children and young people, throughout the country to ensure we make our natural world a better place. The views and energy of young people will be key to achieving this." "We want every child to have the best possible start in life and grow up healthy and happy. This £10 million investment will ensure even more children can enjoy the many benefits of discovering nature, from improved mental wellbeing to better physical health. "It builds on our recently published ‘passport’ of enrichment activities, designed to inspire children to explore the outdoors and make the most of the world around them."